Russia and NATO: Moving towards a collision on missile defense? While U.S.-Russian relations may stagnate after the passage of New START, Russia's partnership with NATO could have an interesting year. Of course this is not to say that nothing happened between Russia and the 28 NATO member countries in the year 2010. Actually, a number of positive developments occurred. There has been a dramatic improvement in Russia’s relations with Poland; a long-awaited maritime border treaty with Norway has been signed; and a number of important steps have been taken towards visa-free travel between Russia and the EU. 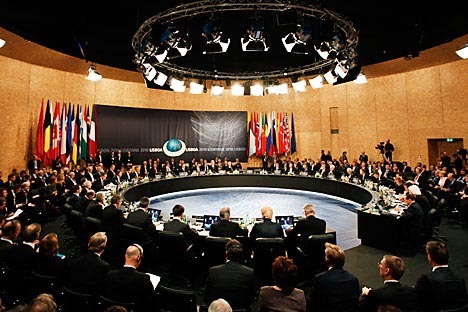 Finally, at the November summit of the NATO-Russia Council (NRC) in Lisbon— attended by Russian President Dmitry Medvedev—the two sides issued an important statement claiming that “the security of NATO and Russia is intertwined.” Moreover, the Alliance invited Russia to participate in the development of a European missile defense system. The growing rapport between Russia and NATO reflects the changing attitude that the leadership and the people of Russia harbor vis-à-vis the Alliance. True, Russia still objects to NATO’s eastward expansion. (Russian Foreign Minister Sergei Lavrov keeps pointing out, however, that it’s the expansion, not NATO itself, that is viewed in Russia as a threat to its national security.) Yet, the Kremlin seems to be warming up to the argument, recently articulated by prominent academic, Alexei Arbatov, that despite the geographic expansion, the 28 member states of the Alliance today have less weaponry and fewer troops than possessed by the 16 original members 20 years ago; besides, the bulk of NATO forces are not deployed on the newly acquired territories. In other words, there are no signs of the Alliance’s military focus on Russia. Russia and NATO share many of the same challenges facing the Euro-Atlantic community at large: threats of proliferation of weapons of mass destruction; spreading Islamic radicalism; trafficking of arms, drugs and people; potential disruption of energy supply routes. In addition to these common concerns, some Alliance members represent Russia’s largest and most trusted trading partners. On the other hand, there is no shortage of irritants in the relationship. The Alliance is unhappy with Russia’s 2007 suspension of its participation in the Treaty on Conventional Forces in Europe, and NATO considers reinstating this treaty one of its top priorities. NATO is also troubled by the deployment of Russian tactical nuclear weapons in the Kaliningrad region. In addition, some member countries, in particular from Central and Easter Europe, keep complaining about Russia’s alleged possessiveness over the post-Soviet space. Russia, for its part, recently voiced objections to NATO’s intentions to create military plans for the defense of the Baltic countries against Russia. Yet, it is a disagreement over European missile defense that has the potential to cause a serious set back in Russia’s relations with NATO. Russia’s insistence on building a common ABM infrastructure stems from the fear that in the future, the NATO system could be potentially used against Russia itself. This sentiment is exacerbated by Moscow’s skepticism about NATO’s perennial claims that the new system will be targeted primarily at Iran. Instead, Russian military experts caution that a system over which Russia has no control may threaten Russia’s second-strike capability. So far, NATO has been rejecting the “two key” approach. Instead, the Alliance insists on building two independent, though tightly coordinated, systems. At the core of NATO’s unwillingness to accommodate Russia’s concerns lies a concern of its own: According to Article 5 of the North Atlantic Treaty of 1949, collective defense is the sole responsibility of NATO member states and can’t be “outsourced” to any outside partner. From NATO’s perspective, the only workable solution would be restricting the cooperation to information exchange and possible synchronization of two independent systems. Not to mention the fact that any agreement postulating a decision-making role for Russia will never be accepted by conservatives in the United States. Despite continued talks about possible compromises, not much time is left to iron out the differences: A decision on missile defense cooperation is expected to be reached at a meeting of NATO-Russia Council’s Defense Minister in June. How might Russia react if its proposal gets rejected? Rogozin suggests that Russia will have to develop and implement new attacking systems capable of overcoming any ABM defense system, an opinion recently echoed by Russia’s top military brass. President Medvedev, too, warned that the failure to cooperate on missile defense is likely to re-start a new arms race. Some Western analysts remain more optimistic. They argue that a new arms race will place heavy financial burdens on both sides, but Russia will be hurt the most because the country will be forced to curtail its expensive modernization agenda in order to build more weapons. Besides, NATO has a clear technological advantage over Russia in ABM building capabilities. Having faced tough realities, the Kremlin may well decide that joining the effort on NATO’s conditions would be the lesser of two evils. And Russia can always use its advantage in tactical nuclear weapons as a bargaining chip to strike a better deal that could mollify domestic hawks. Then, all the Kremlin has to do is to announce yet another diplomatic victory. And isn’t that what all politicians around the globe are so good at?